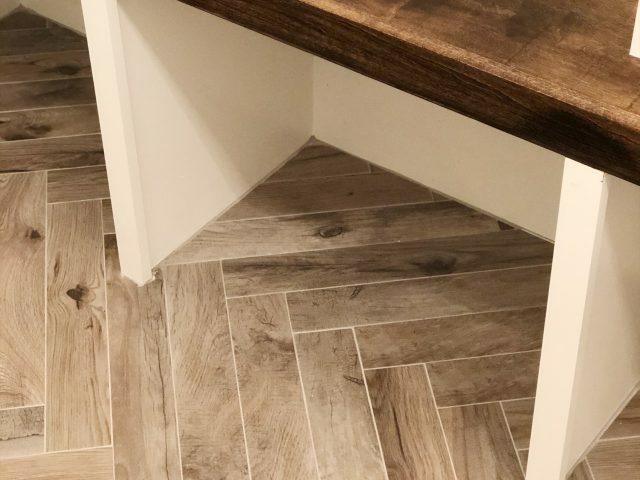 Mudrooms are a smart and efficient way to keep your home organized. 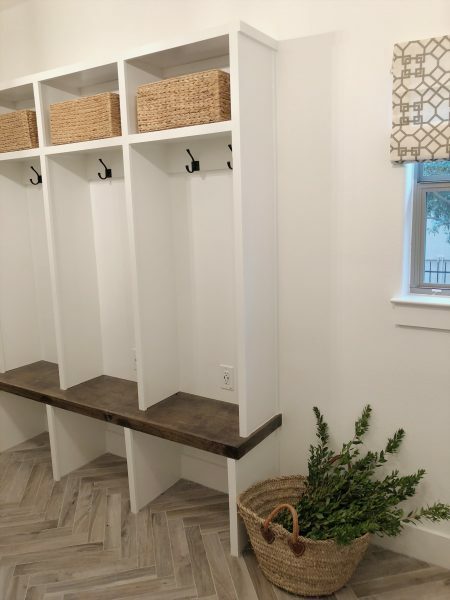 Mudrooms can store clutter and when designed properly, they offer a smooth transition from the outside to the inside. In this particular project, the laundry room was right by the garage, but it was very small. It was only large enough to really house a washer and dryer. Our clients wanted to make this space larger and more functional for their family. 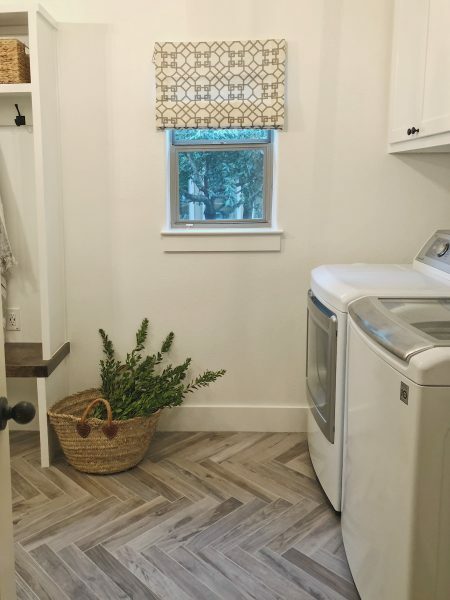 Here are the details of this cramped laundry room transformed into a spacious and stylish mudroom. The laundry room is right next to the garage. There was not much room for storage in here, but the garage had plenty of room to spare so an extension into the garage made sense. 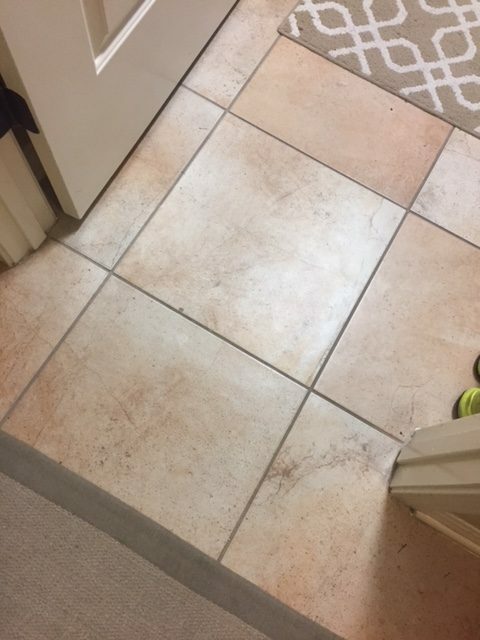 Below is a picture of the laundry room tile floor that lacked any special detailing. With the help of a contractor, we were able to nearly double the size of the laundry room to create a large mudroom. We expanded the laundry room into the garage, which as we mentioned before was large and could spare the space. The mudroom now can house the washer/dryer, cubby lockers, extra cabinets, a beverage fridge and more. 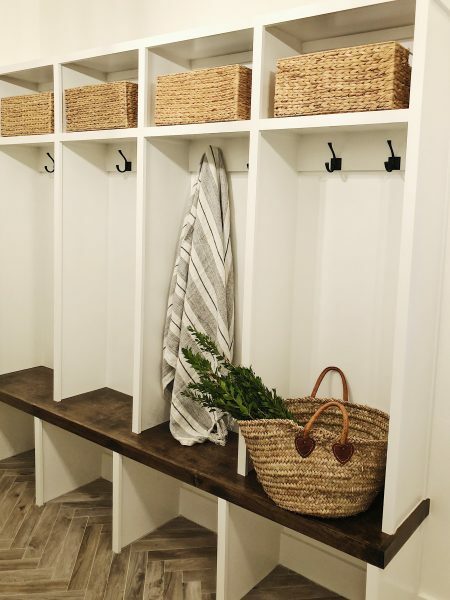 The custom locker is an essential element of the space. 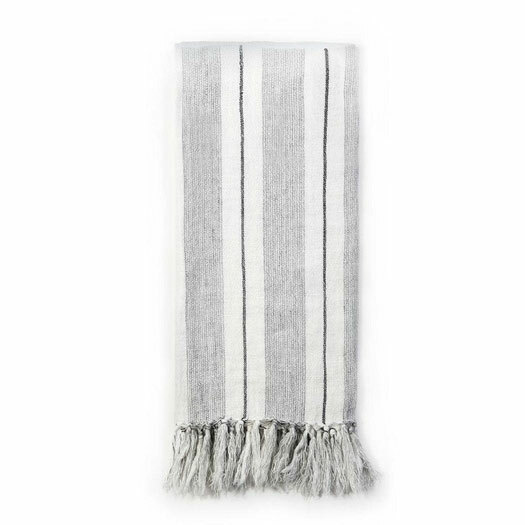 It will help our client’s children stay organized for school, sports, and activities, while giving mom organizational bliss. This space can grow up with their young boys and all of the gear that is associated with sports and school. 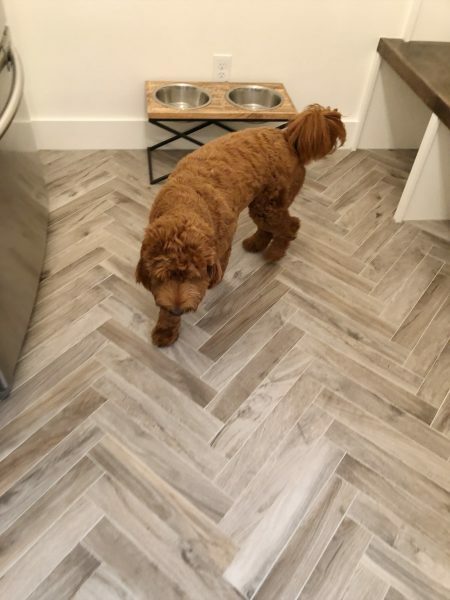 The family also has two dogs and they even have their own area in the new mudroom! The cubbies and hooks allow each member of the family to keep their backpacks, shoes, and outerwear organized. The baskets above each locker allow for even more storage space. You will notice each locker also incorporates a plug so that each section can also serve as a charging station. 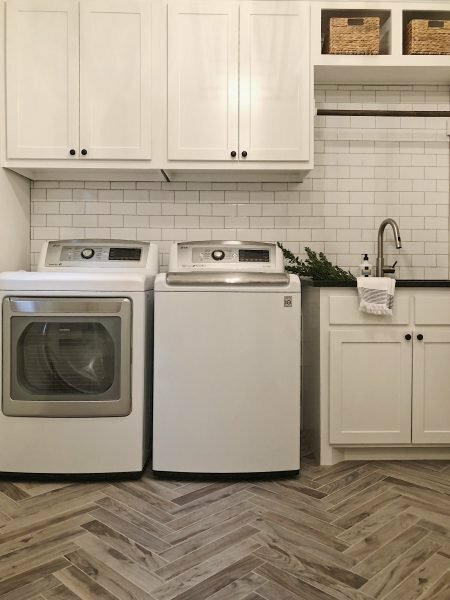 For a clean, seamless look we installed white subway tile behind the washer and dryer. We added upper cabinets with a shaker front detail for added storage. 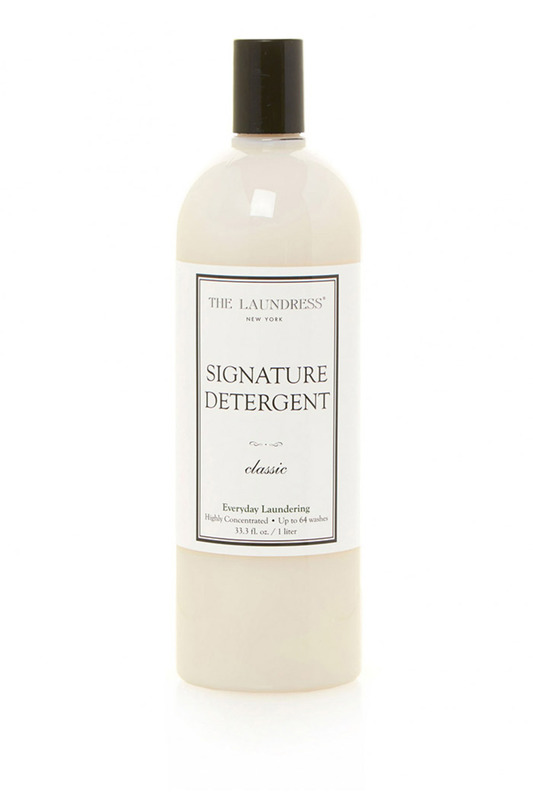 The cabinets give a place to hide laundry detergent and other supplies. The sink countertops were replaced with a durable black granite. The combination of white cabinets with black counters offers a timeless look to the mudroom. The wood stained clothing rod also gives a space for hangers, clothes and other laundry prep. 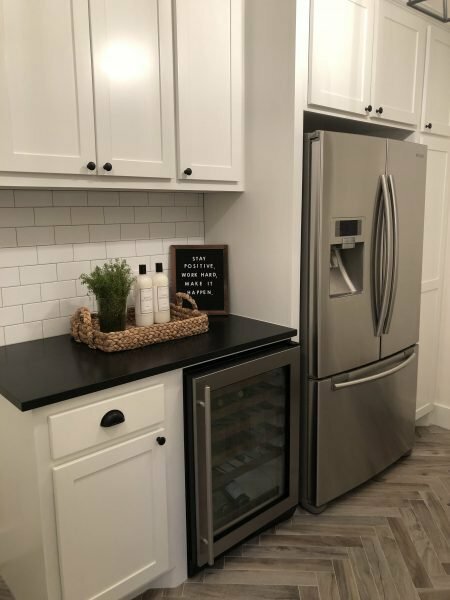 A completely new addition in the mudroom includes a wall of cabinets and two beverage refrigerators, including a wine fridge. There is also plenty of storage space for the pet supplies. We added a roman shade with a neutral geometric pattern to keep with the timeless feel of the mudroom. 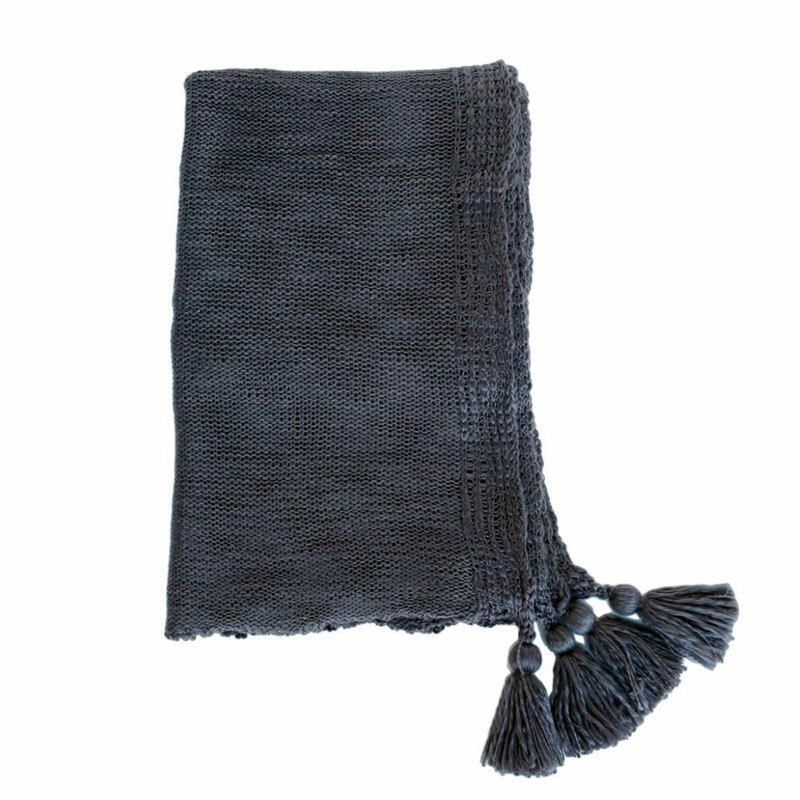 It adds a decorative detail to the space. 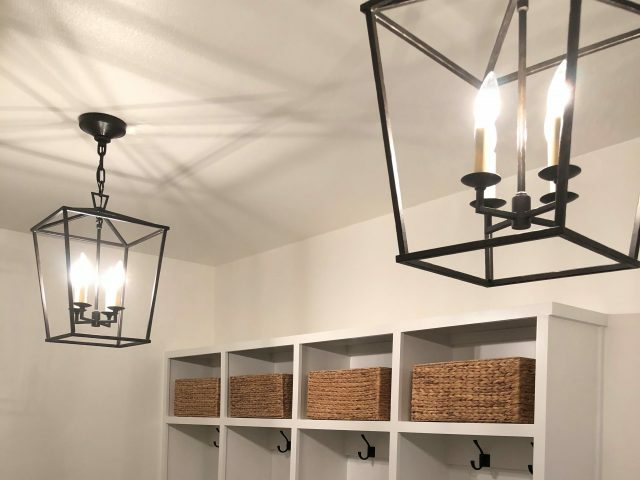 A pair of iron pendants keep the space feeling open and spacious, while adding some contrast against the light cabinets and cubby lockers. It ties in with the matte black cabinet hardware and hooks. The locker bench is stained in a rich brown, which adds warmth and contrast to the space. It is a durable option for a family with 2 young boys. It is easy to wipe up or clean if any muddy shoes or dirty sports gear is left lying around. 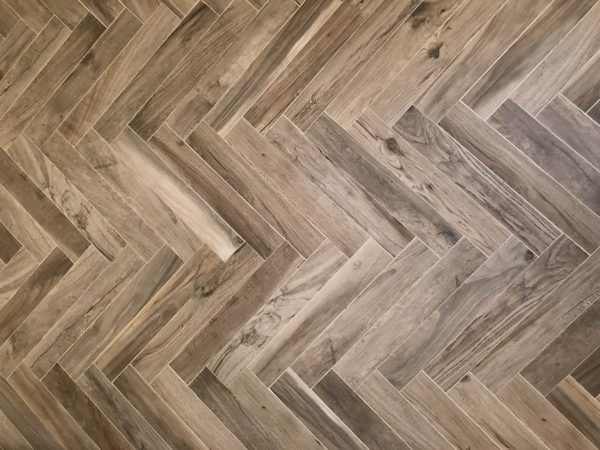 Another wow factor are the gray wood plank porcelain tiles laid in a herringbone pattern! 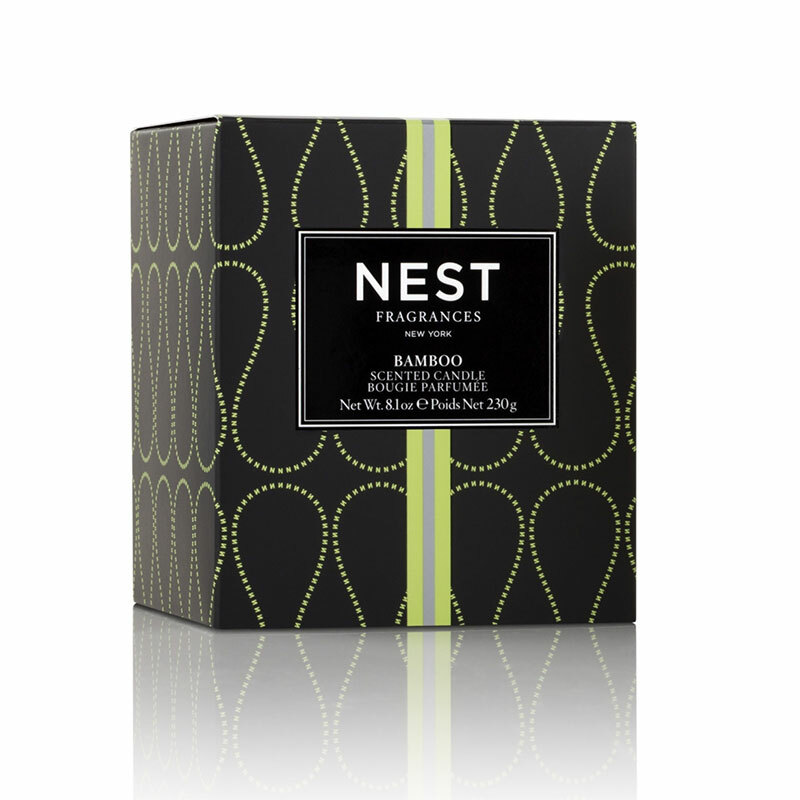 They are stunning in person and add dimension to the space. The newest member of the family, Henry, also seems to be enjoying his new space. It has something for everyone! 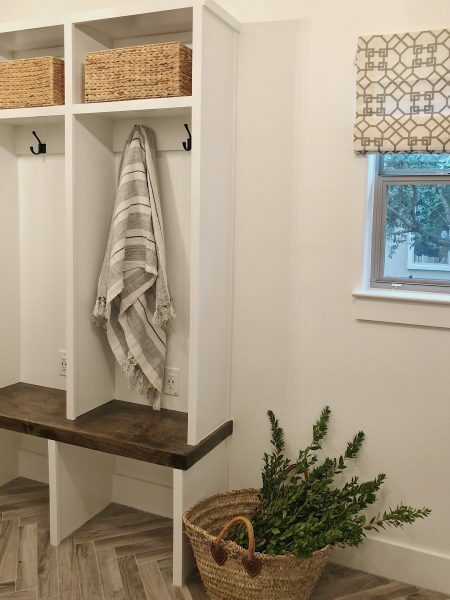 This laundry room makeover into a spacious mudroom is such an uplevel. 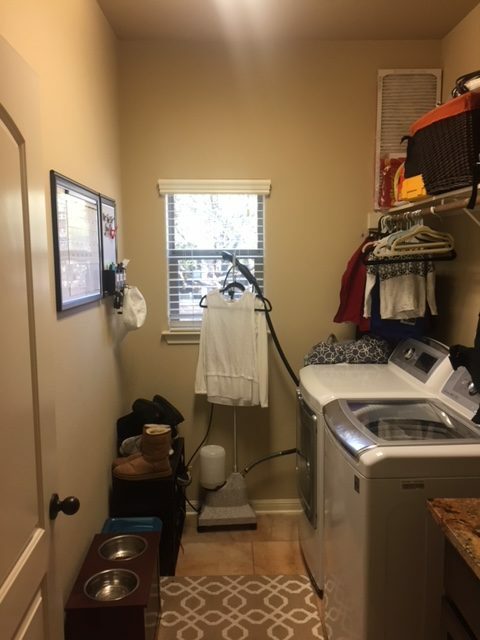 We love helping clients create special spaces like this one that make even the most mundane tasks, like laundry, a little more special. 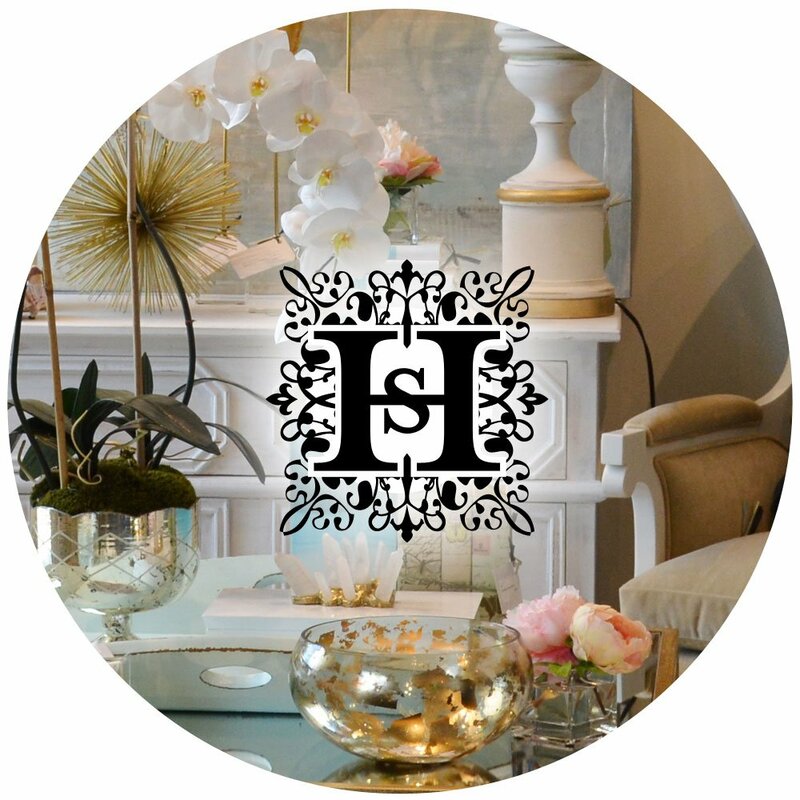 For help on creating your own haven, start with our quick questionnaire as we would love to get to know more about you and your project!